DUNDEE, NY – Mark Smith has figured out the New York slick track and that could be trouble for the rest of the Lucas Oil Empire Super Sprint (ESS) campaigners. The Sunbury, Pa., driver has been known for his success on the Pennsylvania Sprint Car Circuit and now he’s starting to make a name for himself in New York as well. 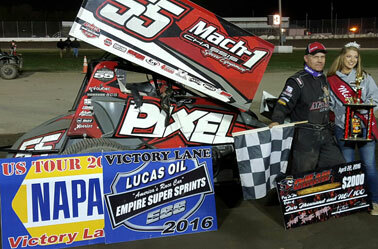 Smith, teaming up with car owner Patrick Vigneault, dominated the 25-lap event on Friday night at the Outlaw Speedway. Smith got the lead early and never looked back on his way to his fifth career series win of his career in the NAPA Auto Parts Tour of the U.S. main-event. The victory was worth $2,275. Shawn Donath opened the race leading the first lap from the outside of the front row. He worked by Larry Kelleher on the top of the speedway to take the lead. Before a second lap could be completed Sammy Reakes IV, Paulie Colagiovanni and Denny Peebles got together causing Peebles to get over on his side. All drivers were okay. Donath was back in command when action resumed jumping in front while Smith made his move on the restart. In two laps Smith was able to go from fourth after starting eighth up to the runner-up spot on lap four. Smith was closing on Donath once he got to traffic on lap seven. He stalked Donath waiting for his opportunity to make a move on by. Smith never had to make that move as Donath slowed on lap nine surrendering the lead and bringing out the caution. From there Smith was in command of the race. He bolted away from the field as Jared Zimbardi and Jason Barney both tried the wrestle the lead away from him. Smith ran the middle groove while his challengers kept trying to work the inner part of the speedway. Smith got to traffic on lap 15 and he began using whichever lane he had to in order to navigate his way through lapped cars. Whether it was high or low it didn’t seem to be of much difference for Smith as his car was able to make the transition. By lap 20 Smith was solidly out in front in heavy traffic while Zimbardi, Barney and now Steve Poirier were waging a three car battle for the second spot. The three swapped slides jobs while making moves through slower traffic to gain the advantage. At the checkers it was Smith by a healthy margin with Bradford, Pa., driver Zimbardi taking home the second position. Zimbardi won the last Empire Super Sprint event back in 2014. He was strong throughout but just couldn’t get close enough to muster a challenge on Smith. Poirier ended up third after struggling early in the main-event. He found something on the top allowing him to get into the mix near the conclusion of the race battling with Zimbardi and Poirier. “I was going nowhere at the beginning so I thought it was going to be a long night,” said the six-time champion. “When the car got less fuel in it the car started performing better. I got racing with Jason (Barney) and Jared (Zimbardi) and it was a lot of fun. In the past I didn’t like racing here but that was the most fun I’ve had on a race track. Barney ended up falling back and finishing in the fourth position with Jonathan Preston, of Romulus, N.Y., having one of his strongest Empire Super Sprint finishes as he completed the top five. ESS/Outlaw Notes: The make up date from the April 22 rain out proved very successful with a huge 36 car field…Making first ever ESS starts were Josh Azzi, Dan Kuhn, Brandon Kidd and Nick Cooper…For Azzi it was a night he like to forget as he flipped wildly during hot laps, he walked away…Steve Collins turned fast time on hot lap group 1 but a magneto issue forced him on the sidelines for the night…Smith claimed $200 for taking the 7-12 Challenge, he started in eighth…Memorial Weekend will see two big events with a $3,000 to win, $300 to start A-Main at Thunder Mountain and then a $2,000 to win event at Utica-Rome. Lucas Oil ESS 7-12 Challenge - Smith - $200 - $100 at Thunder Mtn, May 28. The Lucas Oil Empire Super Sprints are brought to you by: Lucas Oil, Mach 1 Chassis, Einstein Construction Group, SUNY Canton, NAPA Auto Parts, Hoosier Racing Tires, Donath Motorworx, Insinger Performance, Car Mate Trailers, Fondations 4 Saisons, Beard Sewer and Drain, Cobra Coaches, 911 Restoration, Westward Painting Company, Fondations 55, E&V Energy, Panther Frameworx, YorkMont Auctions,, Engler Machine and Tool, Northwood 2 Construction, Brodix Cylinder Heads, Lacaillade Masonry, FX Chevy, ASI Racewear and many, many associate sponsors!